In advance of their forthcoming fourth full-length album, Slovakia's Signum Regis drops a six song EP, Through The Storm. They also arrive with a new singer in the fold, Mayo Petranin, who has been performing with them since the Exodus album. Through The Storm consists of four original songs, a re-recording of All Over The World from their first album, and a cover of a Yngwie Malmsteen medley, Vengeance/Liar. The musical context remains the same: basic melodic heavy and power metal. My first reaction to the new songs was mostly ambivalent, been there, heard this before. The music was rather typical of the band and genre. Yet the songs seemed heavier and more hard charging than past material. And I wasn't to enthusiastic about Petranin's voice. He's got a bit raw hoarse timbre to his voice that takes some getting used to. But after a second spin, my appreciation improved, notably with Through The Desert, Trhough The Storm and My Guide in the Night, both of which have transparent melody amidst on the rumbling power metal riffs. Also, Come And Take It develops more on a rock than a strict galloping power metal pace, and it has a nice harmonious vocal arrangement. As for the re-recording, I can't speak to the original because I never heard it. Suffice to say, musically, it fits in the context of the orignal tunes here. Also, I've never heard the particular Malmsteen medley either or, if I have, I've surely forgotten. Signum Regis' version full tilt, guitar's blazing, power metal tribute. The pace is breakneck, the guitars flaming. All in all, I guess it's a good a substitute while waiting for the next album. If you're a fan of the band, you'll need to decide if you'll spend the coin now or later, especially if the same four original songs show up on the next album. If they do, buying this now would be like paying twice for the same thing. 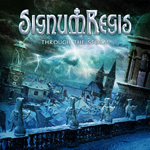 Through The Storm finds Signum Regis still delivering their heavier power metal, and so stay true to form.